Mom, CPA, and full-time fashion setter, Chantelle is the master of multitasking. Her style is on the same page, too — mixing modern bohemia with southwestern flair and bold accessories. When she’s not road tripping across New Mexico, you’ll catch her checking out art galleries and music festivals. There's no shortage of natural style inspo in the Southwest, whether you're watching the sun bounce off the desert landscape or taking in a surreal pink sunrise from inside Albuquerque's famous hot air balloons. These scenes are bound to inspire your look, which is why we headed there for City No. 3 on the Style Squad tour. In partnership with Walmart, we’re traveling across the country to see how different cities make the new Time And Tru and Terra & Sky lines their own. We tapped Albuquerque style expert Chantelle Wagner to guide three locals in putting together their own versions of the looks. With three more cities to go, we're excited to see how Albuquerque puts a Southwestern spin on the collections. Wagner wears a Time And Tru top, skirt, shoes, and accessories. When it comes to Albuquerque style, Wagner says, "I think it's a mix of cultures — it's a melting pot." 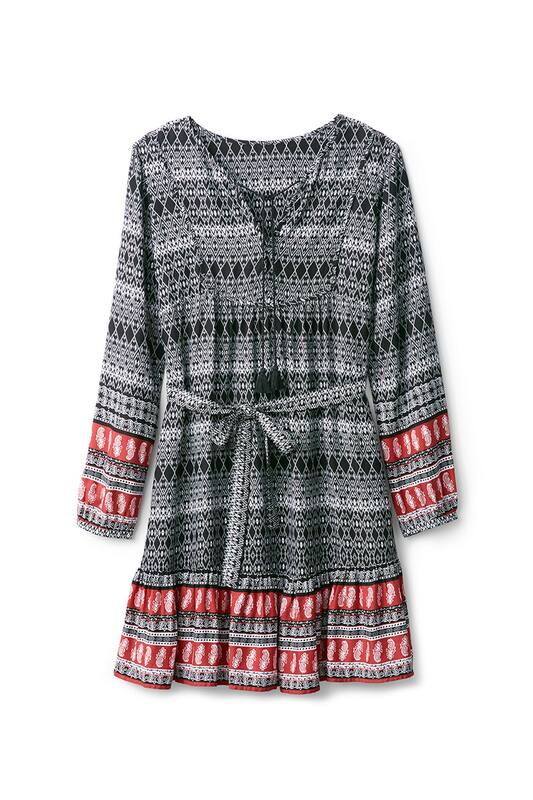 The looks around you can be inspired by Albuquerque's roots, which include Spanish and Native American influences. "You have a mix between earth tones, the desert colors, but then you're also getting these very vibrant reds and yellows and more of that," she says. "I don't think New Mexico is on-trend, it's more its own distinct look." For Wagner's look specifically, she paired a flowy bohemian skirt with a classic tee, earrings, and a multi-tiered necklace. "There's three different layers, so it’s more of a statement," she says. "The more, the better — you can wear like five bracelets on each arm, and you fit right in. If I'm going to wear jewelry, it has to be something big and bold and authentic." Daniels wears a Time And Tru top, jeans, shoes, and accessories. Echoing Wagner's sentiment, Daniels says Albuquerque style is about being comfortable — not necessarily blending in with the people around you. "I always go for whatever feels good," she says. "I don't necessarily jump on trends per sé, but I'm more into what looks good and feels good to me." Daniels says she lives in ripped jeans, and the playful cutouts in her top added an unexpected twist to the look. While Wagner said her usual footwear go-to is sandals, she considers Daniels's denim sneaker an excellent adventuring shoe — perfect for exploring local art and history exhibits at the Albuquerque Museum. "They look really comfy and cute," Wagner says, "definitely if you're going to be shopping or going to a museum, it's a lot of support." Chavez wears a Time And Tru top, pants, bag, shoes, and accessories. For Chavez's look, Wagner says, "You can dress it up or down, or wear it to work in the summer with slacks and heels and look really put together." This kind of versatility is important for Albuquerque outfits, thanks to the dramatic daily shift in temperatures. During our time in the city alone, one day saw a high of 74 degrees and low of 42 degrees. "The pants are flowy and super soft," Chavez says. 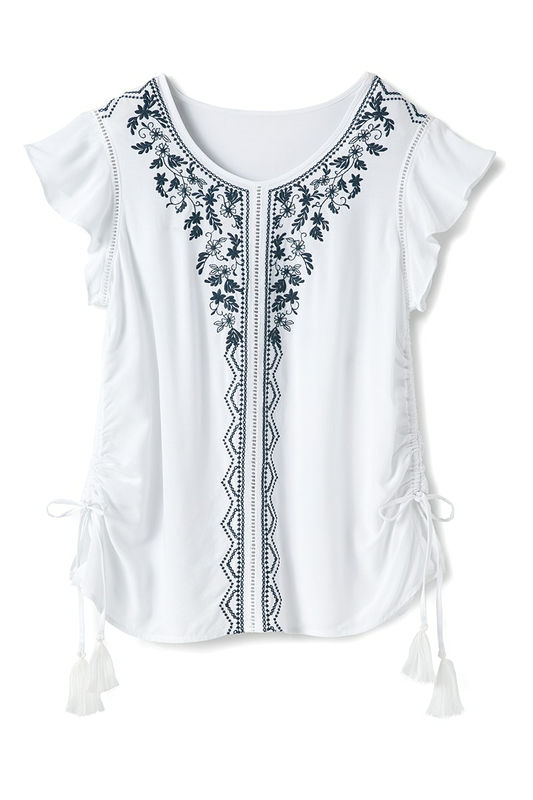 "I like the shirt, too, because of the little designs on the side — it's not super plain." Plus, it's easily layered beneath a denim jacket or similar outerwear once the sun sets. Felice wears a Time And Tru dress, belt, shoes, and accessories. Felice says her dress's color takes major inspo from the dazzling Albuquerque sky at sundown. "[The dress] is the color of the sunset," she says. "It really complements the looks here with this rosy kind of color." "I’d wear this to a wine festival," Felice says — adding that, in that case, she'd switch up the look with a floppy hat. "Every three-day weekend we have a wine festival — there are quite a few wineries around here." Wagner says another way to change the look is through accessories. "This would look really good with coppers, like southwest energy," she says. "It's just really free." Photos: Lauren Perlstein; Art Director: Bry Crasch; Hair and Makeup: Janine Maloney; Assistant: Nikki Cartwright; Stylist & Senior Editor: Jenna Wexler; Junior Art Director: Brit Phillips. 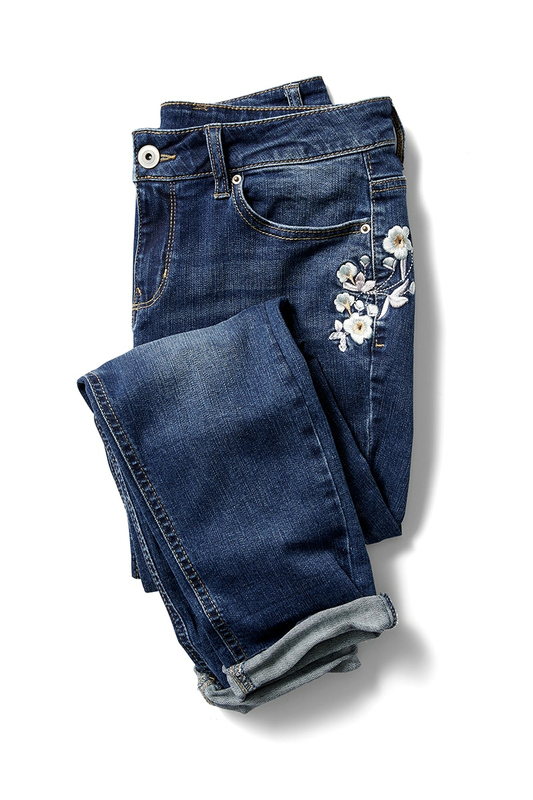 Sweet floral embroidery makes these jeans perfect for spring or summer — great for a casual date night. 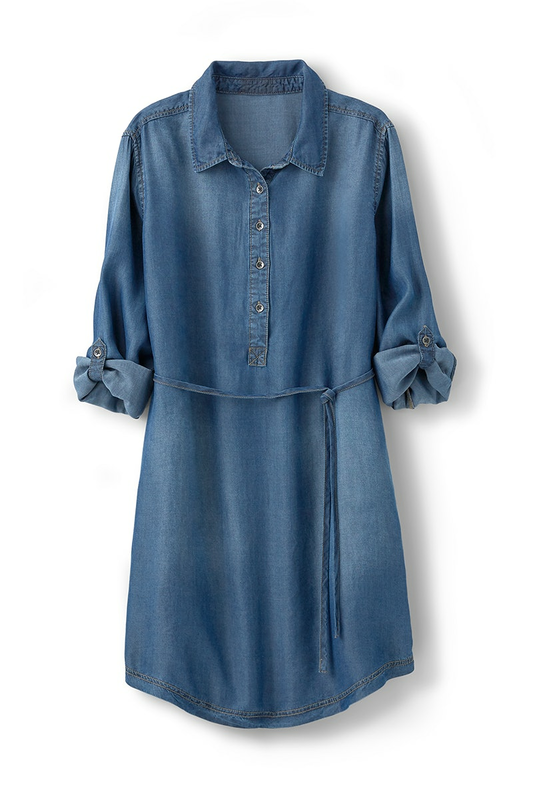 Chantelle's go-to top for a lunch meeting. Stylish, but still comfortable in the soutwest heat. Dressed up with a blazer and strappy heels, Chantelle says this classic can go practically anywhere. Colorful, effortless, and just dressy enough, this is Chantelle’s go-to for a weekend festival. Throw on some booties and you're good to go. 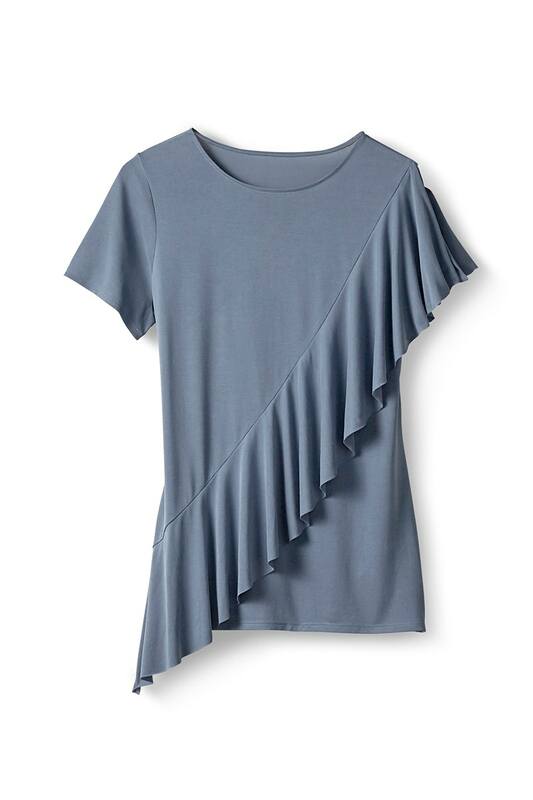 An elevated T-shirt that never goes out of style, Chantelle's wearing this with jeans or a skirt on weekends.